I am a member of a wonderful blogger program called Perky-Pet® Blogger Review Panel. As a part of this review panel, we receive a bird feeder to review and give our opinion! This blogger program has been a wonderful family experience! The kiddos and I watch the birds together and try to figure out what kind of birds show up in our yard:) The kiddos even know what the Perky Pet boxes look like and get excited to see the next feeder! Goldfinches can feed upside down though other birds cannot, making this feeder perfect for making sure the goldfinches get their food undisturbed. The Birdscapes® Upside Down® Goldfinch Feeder has our patented Upside Down® feeding stations which are designed to allow goldfinches to feed without being bothered by other birds. 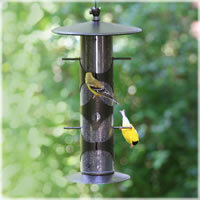 This thistle/finch mixed seed feeder features an attractive metal top, port bands and perches. It has a 3 lb seed capacity. My kiddos get so excited when they see a Perky Pets box arrive!! They rip it open and grab out the new feeder and we put it up as a family! 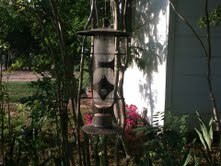 This is what the Birdscapes® Upside Down® Goldfinch Feeder looks like in our yard, didnt they do a good job of hanging it up! The kiddos and I just cant keep the feeder full! The local birds Luv the finch feed! This is a great feeder! Its easy to fill up. Just lift the lid and pour more feed into it and then lower the lid. This has been the most fun bird feeder to watch. We have seen many birds trying to figure out how to use it upside down. ..lol We have watched many birds peck on the side of the feeder cuz they could not find the hole..lol This bird house is alot different then the prior ones we have received. This bird house can not be shaken to get the food out. The birds have to figure out how to get tothe feed, sometimes it takes them a bit! The kiddos like this one the best too... This one is the closest to my window, so the kids sit in my chair for hours watching the birds! These birds are fun to watch they are colorful! You can purchase the Birdscapes® Upside Down® Goldfinch Feeder at Perky Pets and check out the other kinds of feeders they have available at the HOMEPAGE! There is a special at Perky Pets at this time~ Order 2 or more Humming bird feeders and get 25% off plus free ground shipping over $50! disclosure~ I received Birdscapes® Upside Down® Goldfinch Feeder free in exchange for my honest review from Perky pets blogger bird feeder review program.